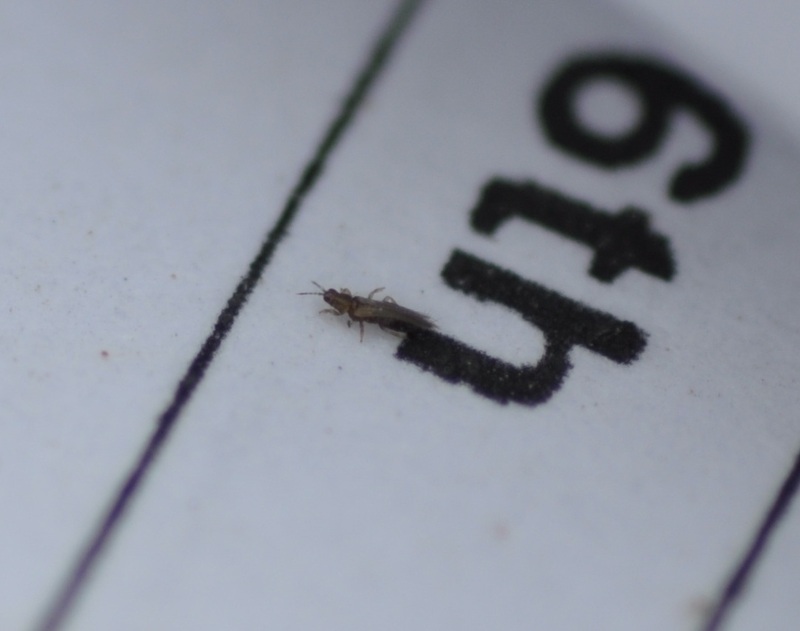 I didn’t set out yesterday knowing the day would play out like it did, but in honor of Cinco de Mayo, we wound up with five insects to discuss. 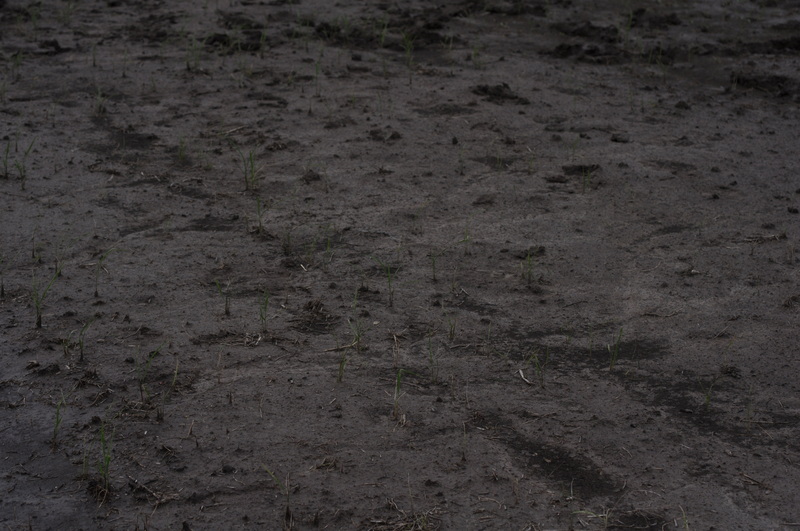 All of which we found in rice fields on Cinco de Mayo. 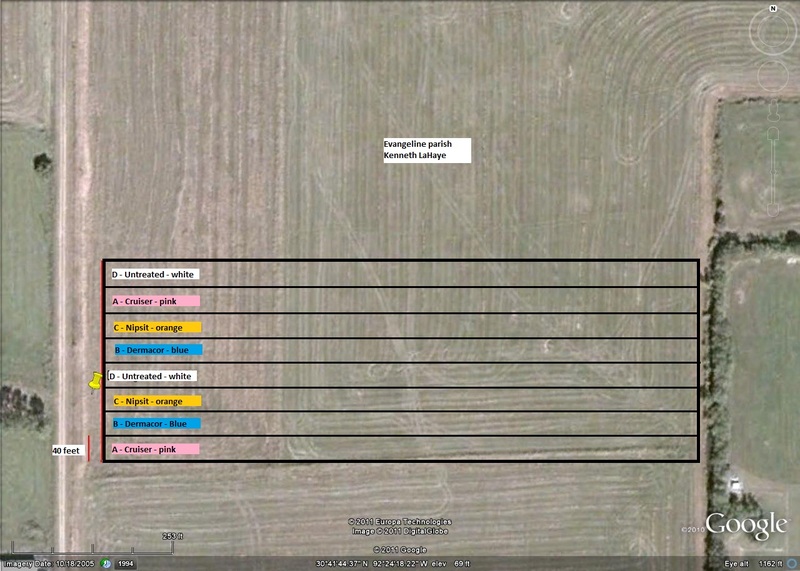 The first thing Benet had described in this field was a reduction in stand in hybrid rice treated with CruiserMaxx. 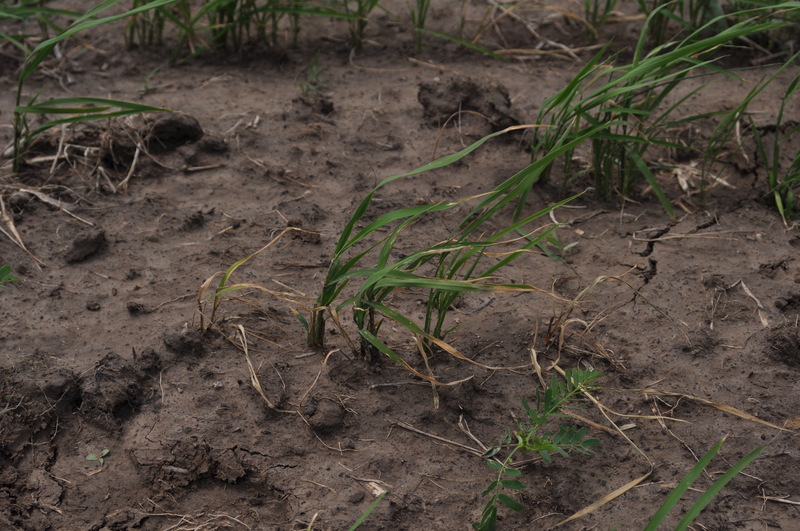 Cruiser had been used because of historical problems with chinch bugs in this particular rice field. 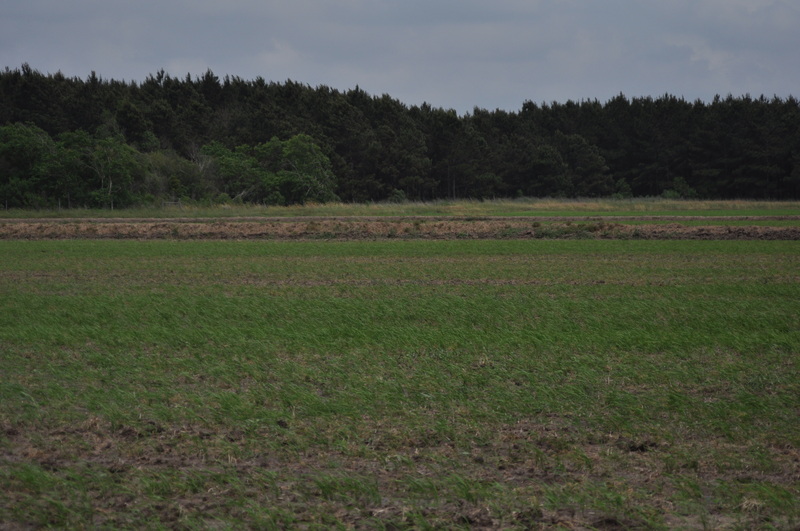 Stand loss in a hybrid rice field treated with CruiserMaxx - injury caused by sugarcane beetle adults feeding on crown of plant. 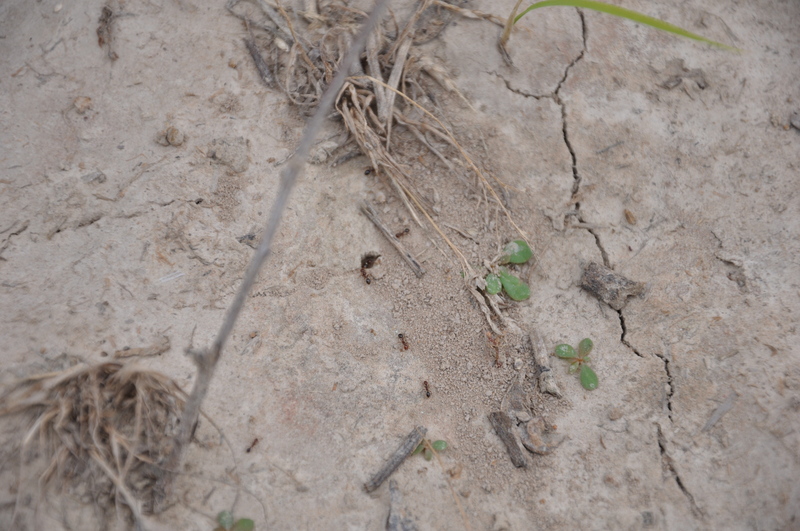 As we walked into the field, it was not difficult to find plants with soil disturbed at the base of the plant. 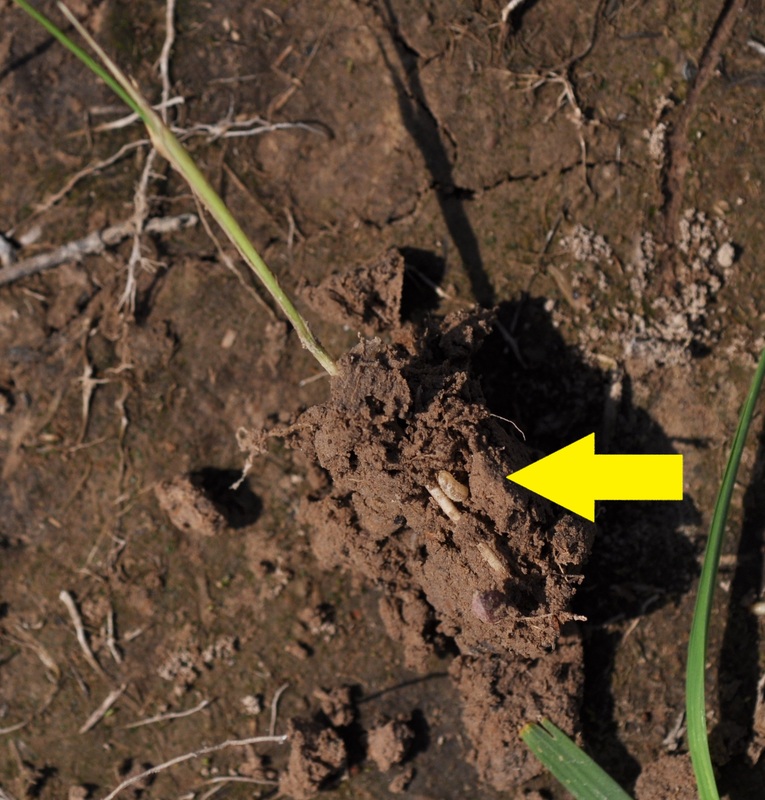 Soil disturbed at base of plant by a sugarcane beetle adult digging. 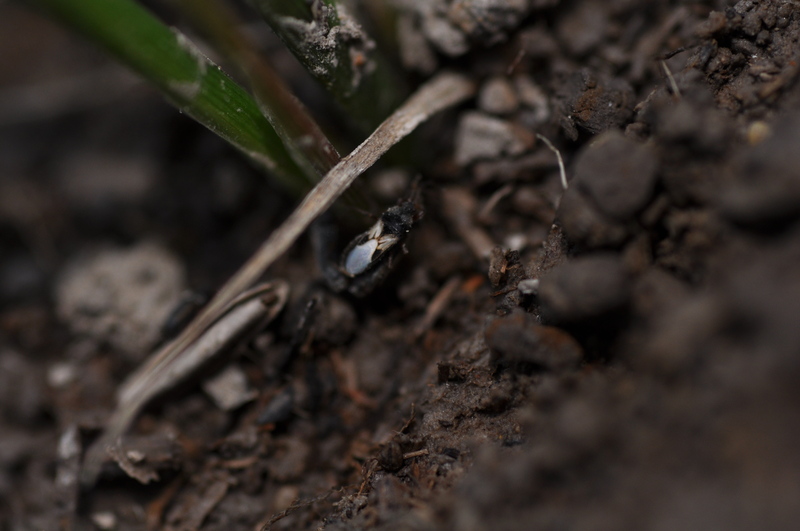 We dug around the base of the plant and in many places were able to quickly locate a large black beetle. 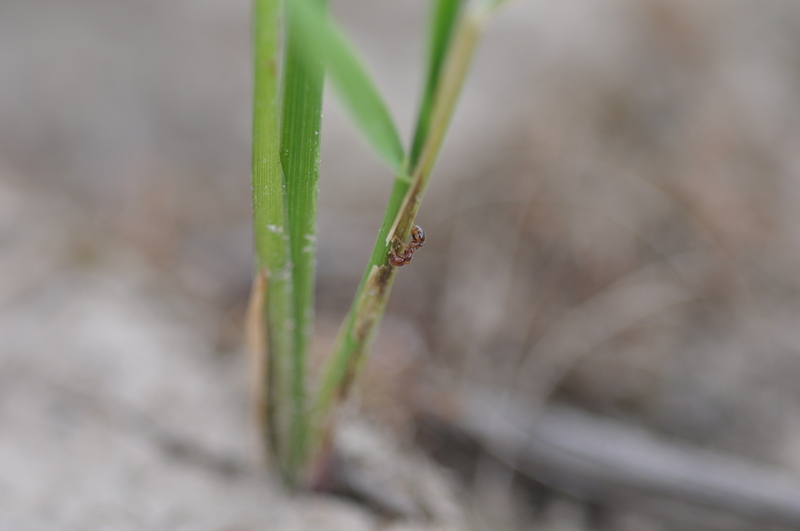 Sugarcane beetle adult with injured rice plant. 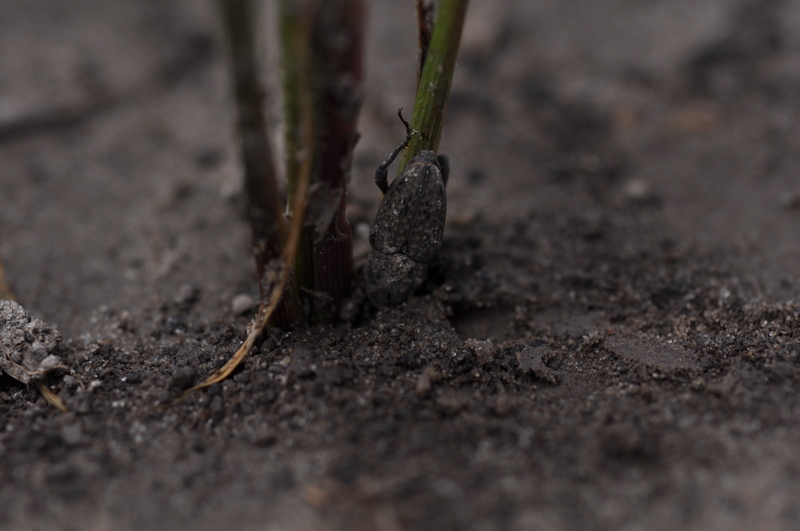 The sugarcane beetles are injuring the rice by chewing at the soil line in the crown of the plant. 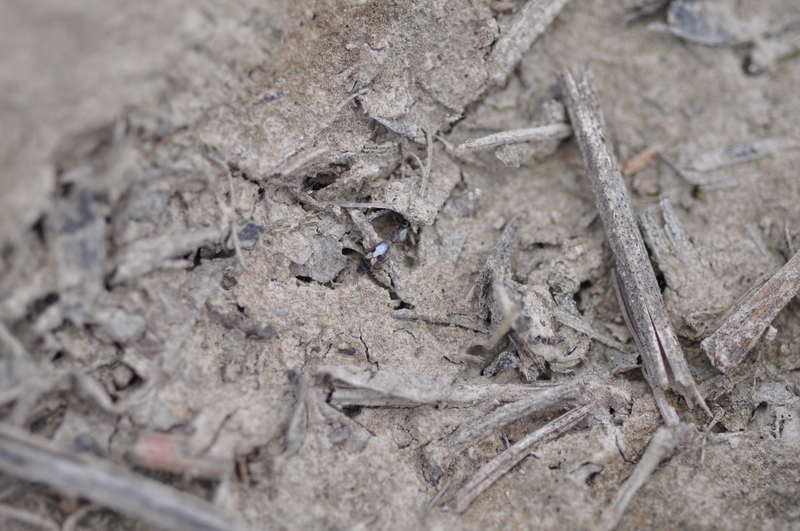 Some of the plants are dead or dying, while others may still recover by tillering. 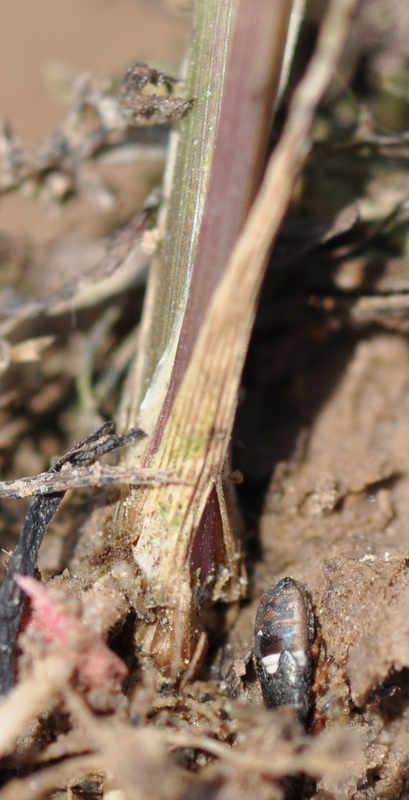 Injury caused by a sugarcane beetle chewing on the base of the plant. 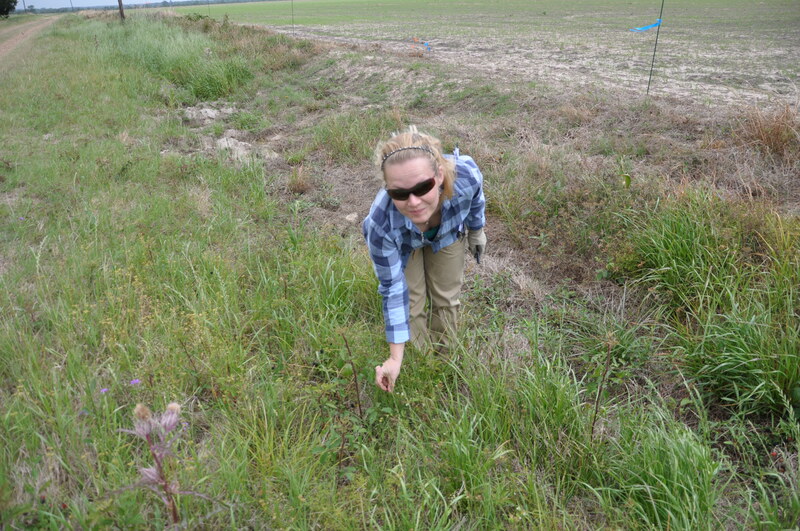 I called Dr. Tara Smith (Sweet Potato Extension Specialist and Entomologist) to learn more about sugarcane beetle biology. Tara studied this insect for her dissertation research. 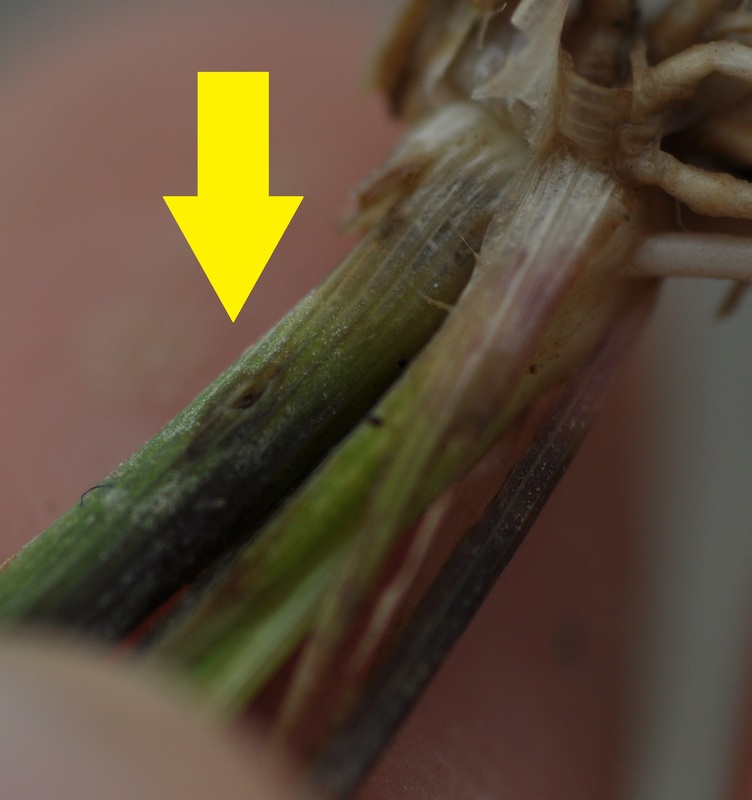 The symptoms we are seeing in rice are very similar to what you will find in field corn (where the sugarcane beetle is causing some injury in Arkansas this season). I discussed treatment options with Tara. 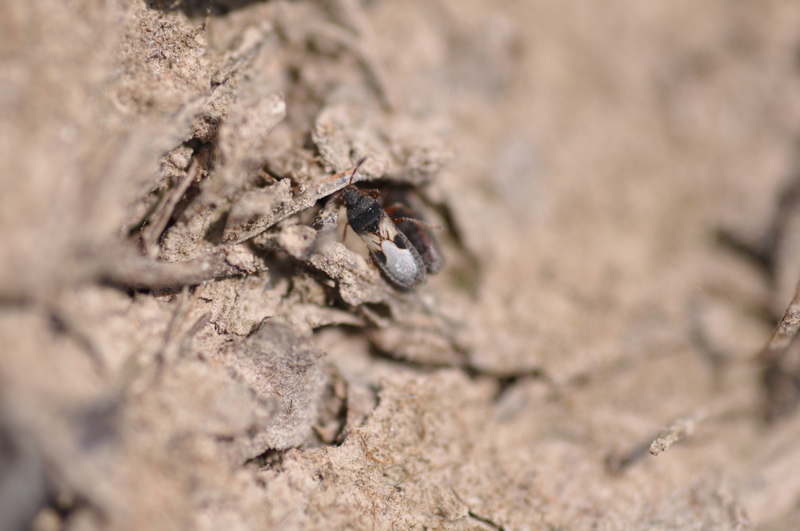 She confirmed that Thiomethoxam (the active ingredient in CruiserMaxx) does not have good activity against this insect. 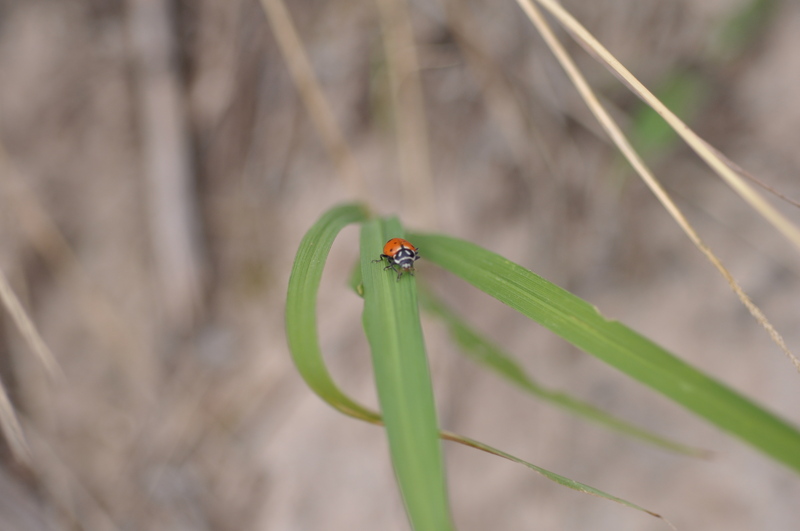 Treatment recommendations are tied to the biology and behavior of the insect. 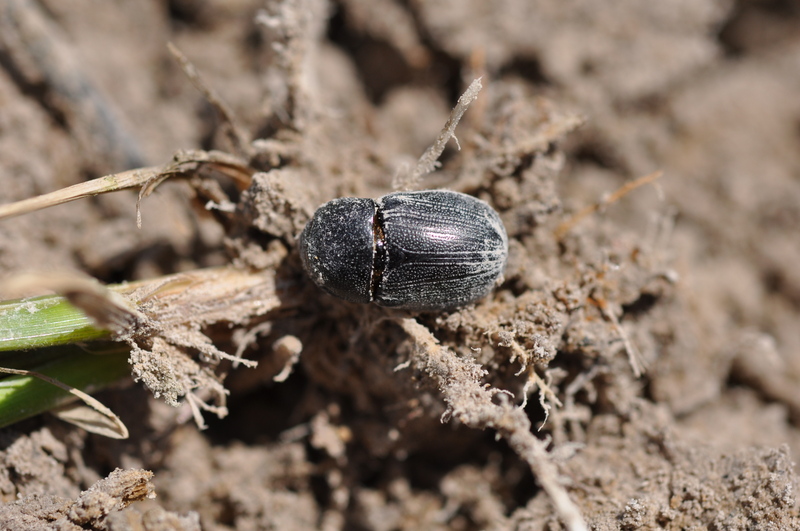 Sugarcane beetles overwinter as adults, and then move into field crops and attack plants at the soil line. During this time of year, they will be flying, mating and laying eggs. Flying usually occurs from dusk to 10 pm. 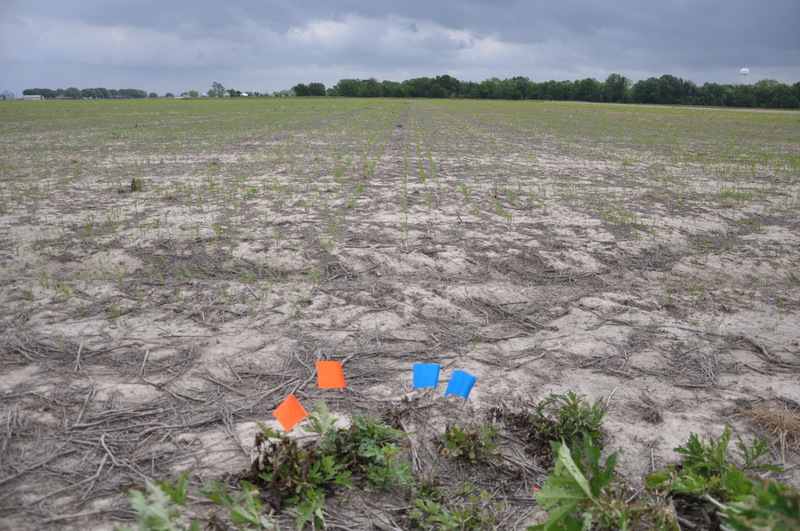 Thus, we advised treating with a pyrethroid sometime around dusk to increase the odds of insecticide coming into contact with the beetles – a spray applied during the day would probably be less effective because the beetles are down in the soil. Alternatively, bringing a permanent flood as soon as possible should also prevent further injury. 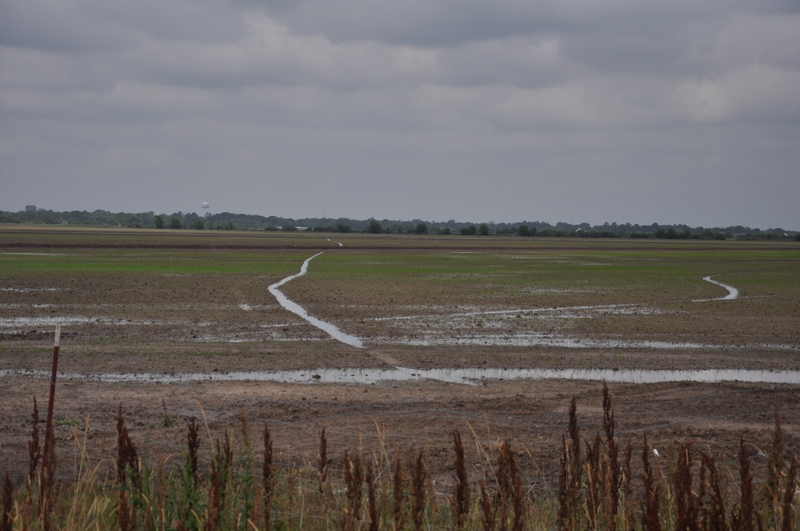 In this field, the rice is not ready for a permanent flood. 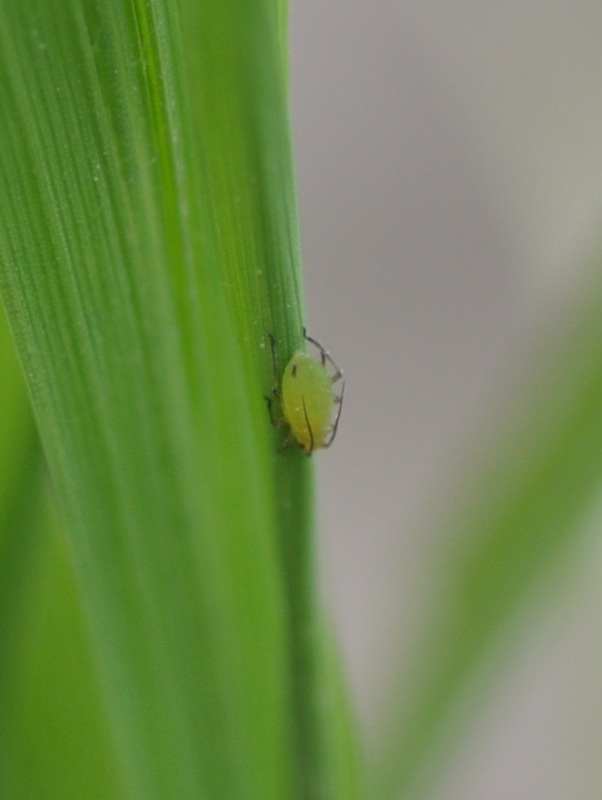 I’ve never observed these insects in rice, and apparently, they are a rare problem. 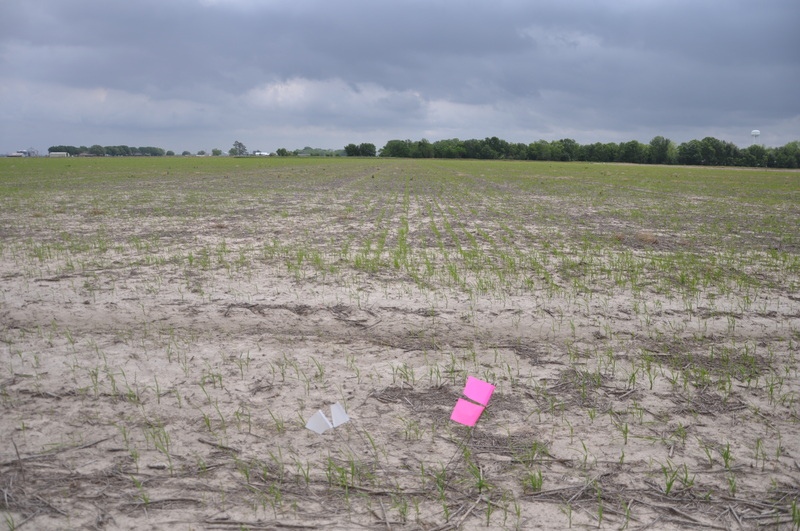 Is anybody else finding these in rice fields? 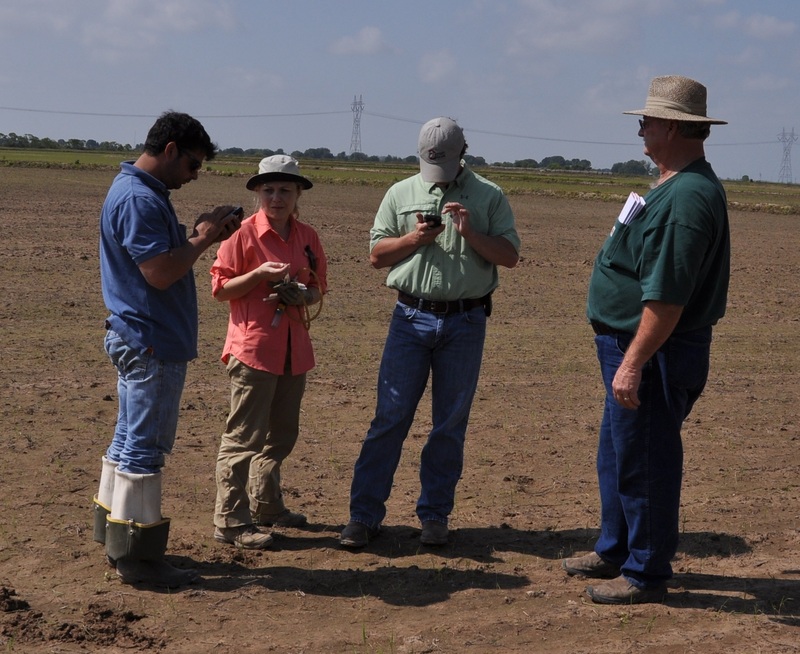 We moved on to another field after we confirmed the sugarcane beetle problem. 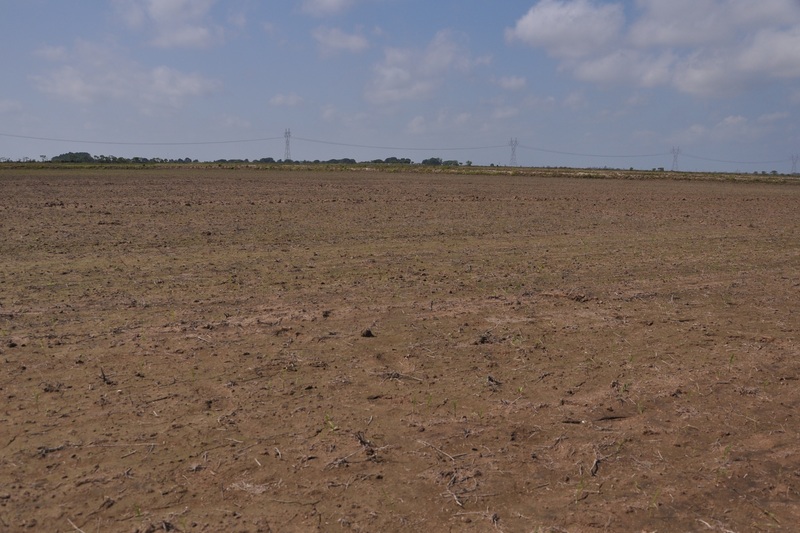 This field was suspected to be infested with colaspis larvae. 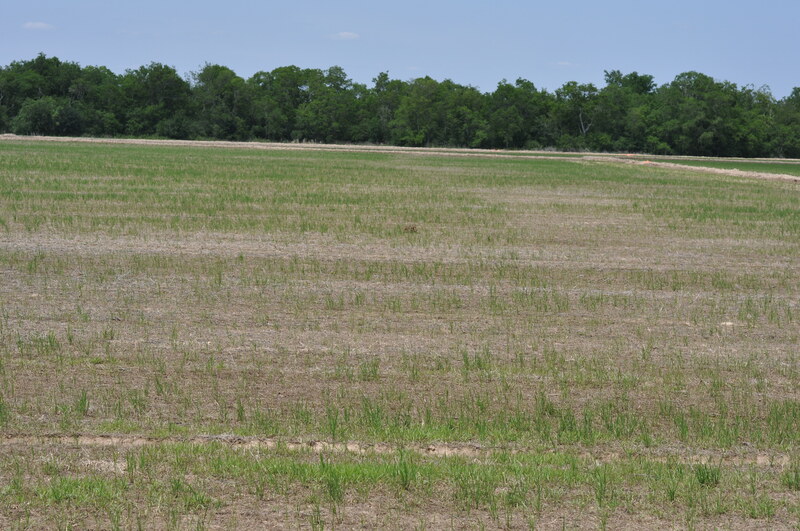 This was a field of hybrid rice which did not have an insecticide seed treatment applied. 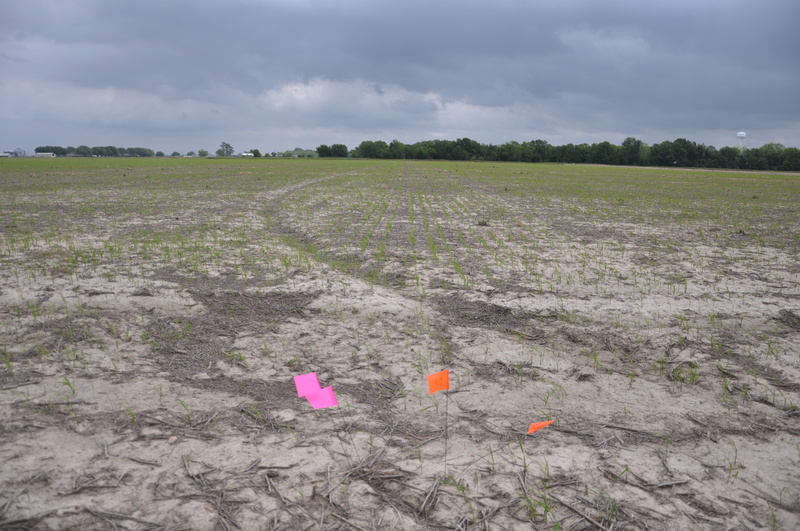 It was drilled into a stale-seedbed, which was planted in soybeans in 2010. Sure enough, we found a severe infestation of colaspis larvae that was reducing the stand. 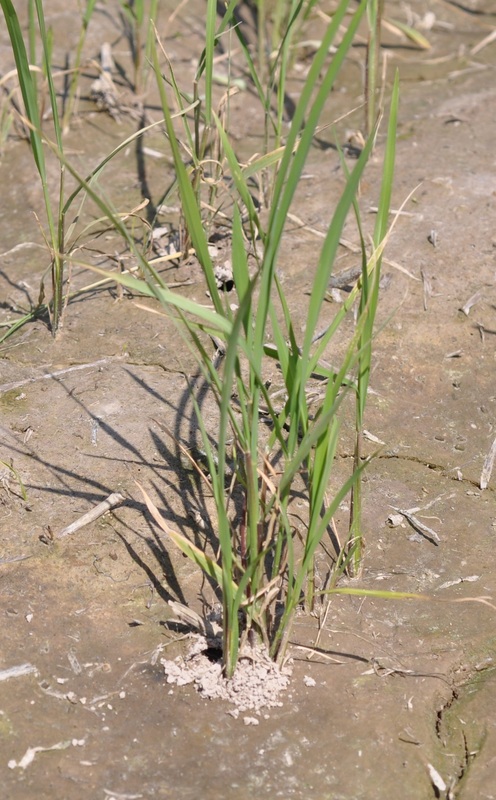 Stand loss caused by colaspis larvae feeding on the roots of rice plants. 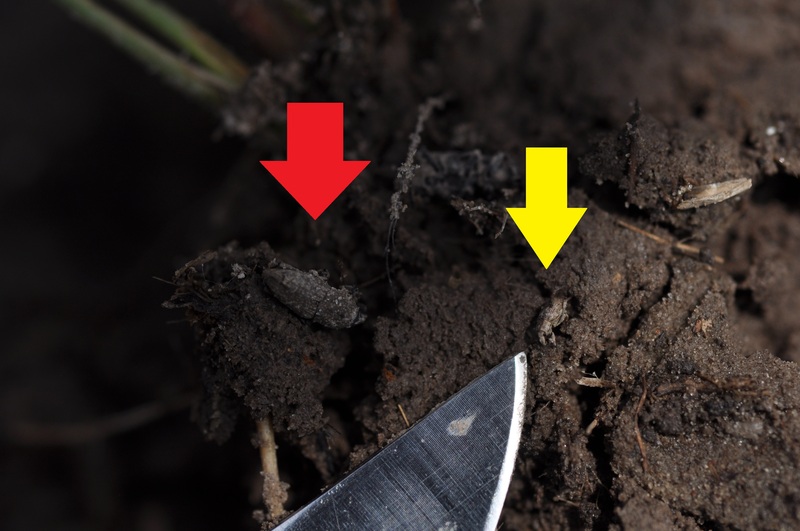 It was not difficult to find colaspis feeding in the soil anywhere from 1/2 inch to 3 inches below the soil line. 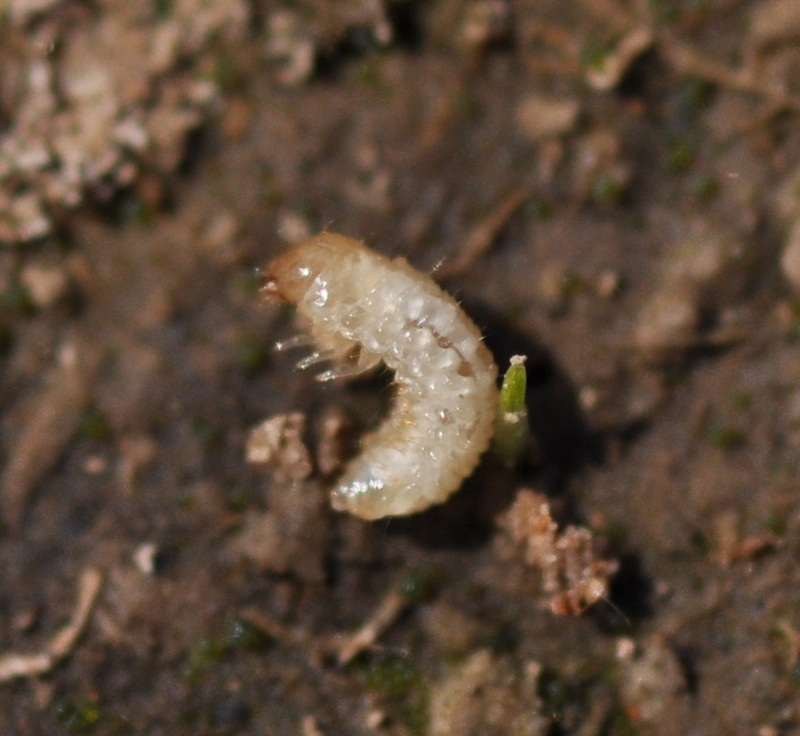 Colaspis larva on root of rice plant. 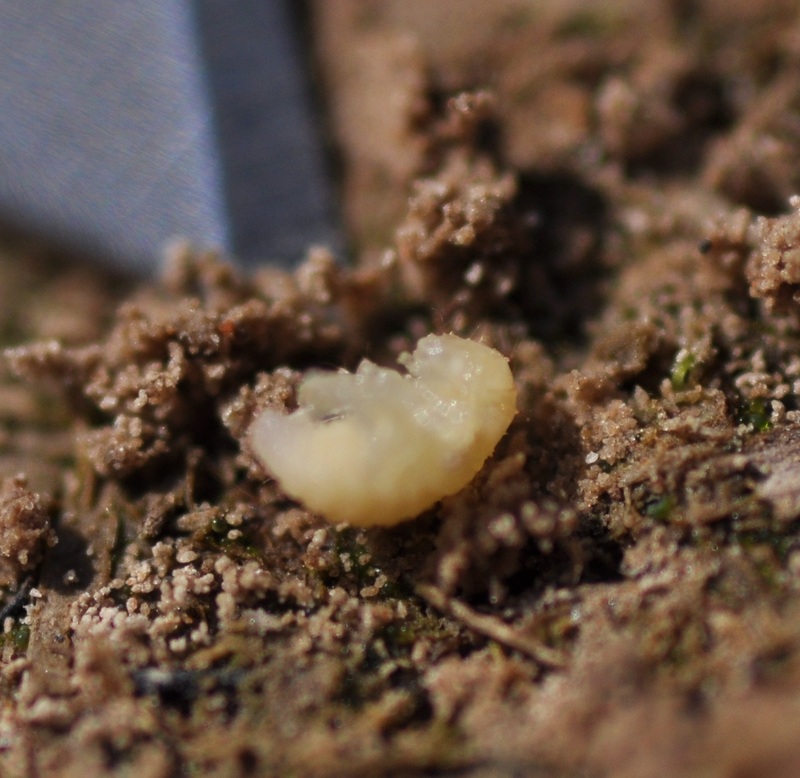 It’s easy to see how these little larva can inflict injury on the roots of a rice plant when you look at the large size of their chewing mouthparts (mandibles). 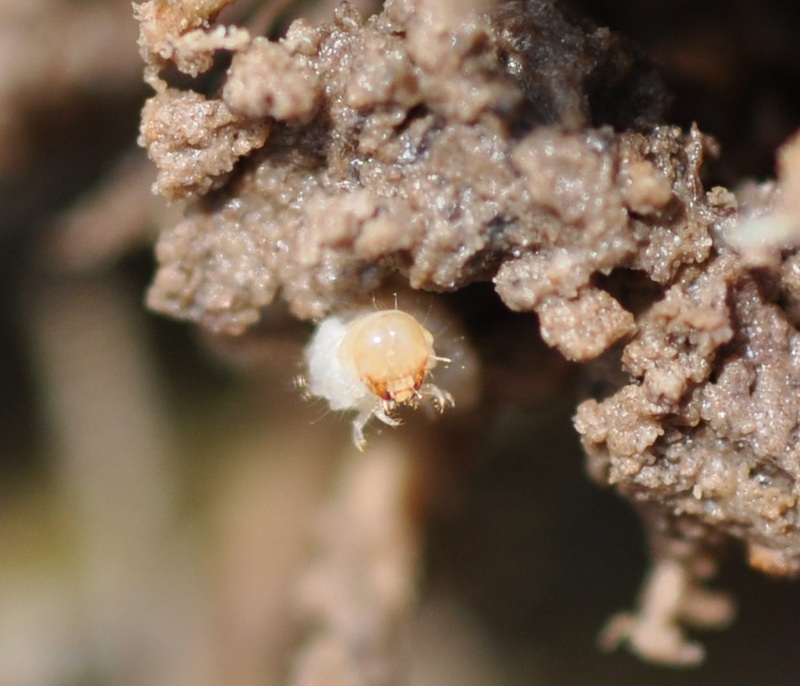 Head-on view of a colaspis larva - the dark brown structures are the mandibles which are used to chew up plant material. We advised applying a permanent flood as soon as possible. 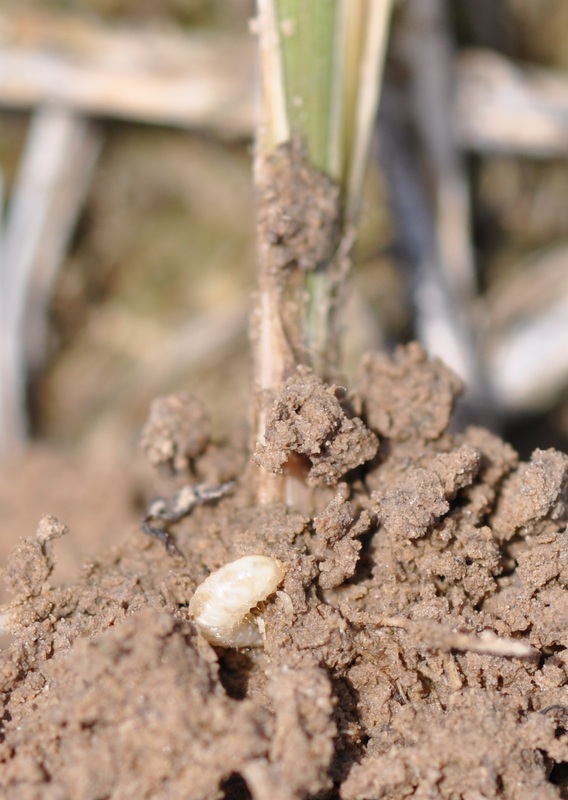 Also recommended using a pyrethroid to prevent injury from rice water weevils – weevil scarring on the leaves was common in the field. 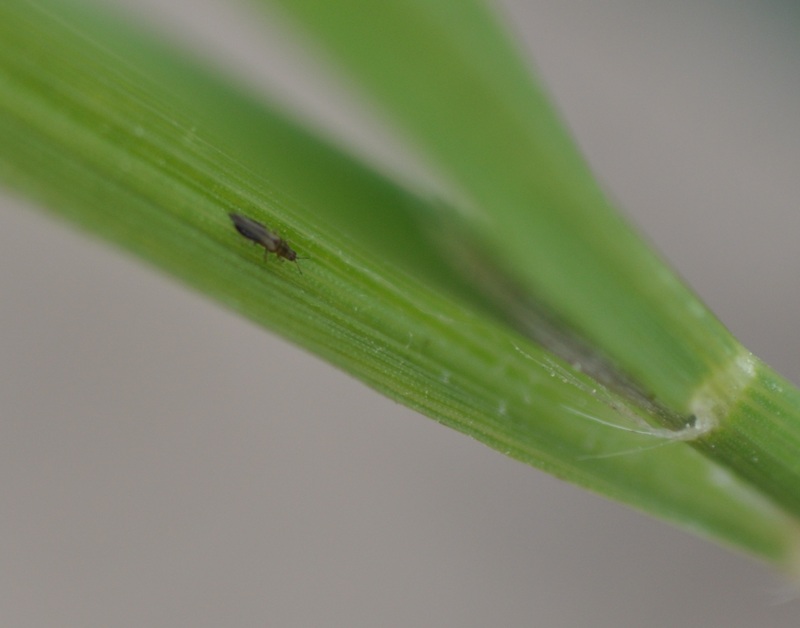 The pyrethoid will not have a significant effect on the colaspis larvae, but the larvae will stop injuring the rice after application of permanent flood. 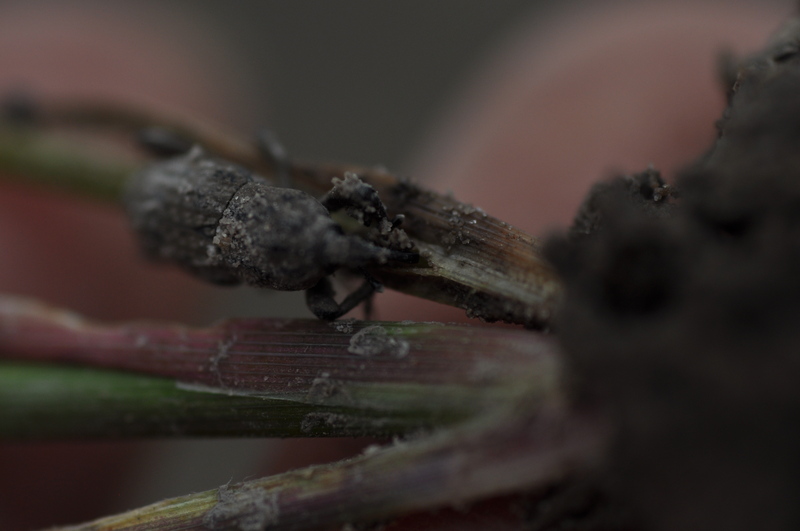 While scouting the colaspis infested field we found a couple of other insects feeding on the rice. This included chinch bugs and a mystery insect. 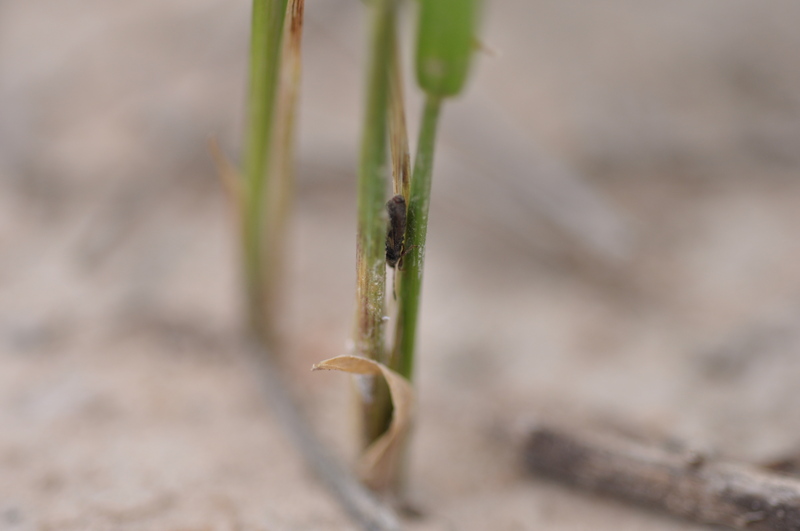 Chinch bug nymph feeding at base of a rice seedling. 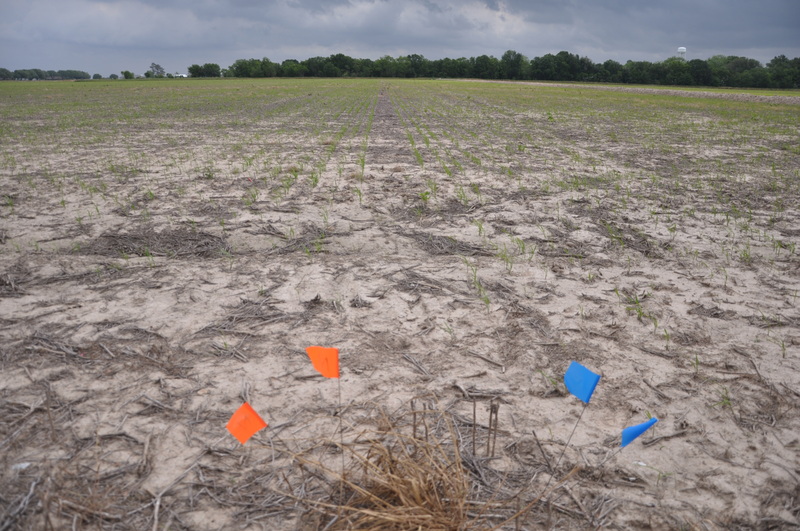 This injury can cause stunting and plant death. 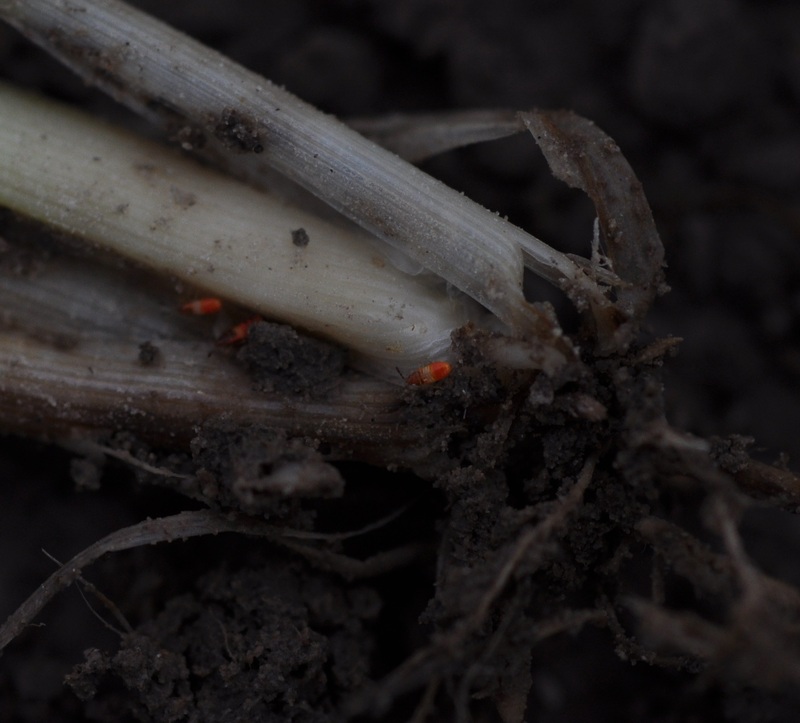 Application of a permanent flood will also stop the injury from chinch bugs, because they will no longer be able to feed on the growing point of the plant once it is protected by the flood water. 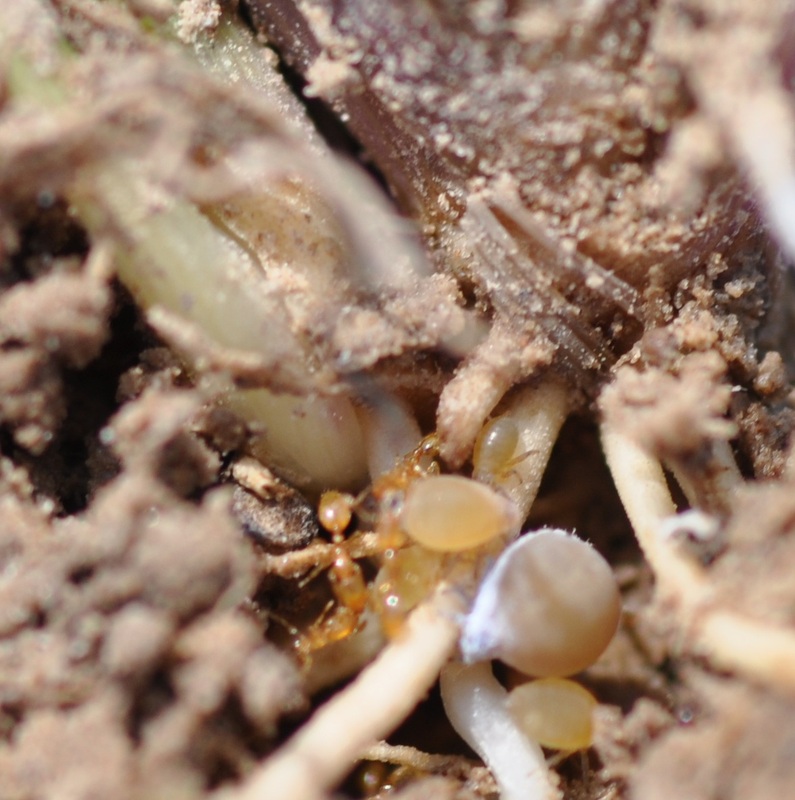 Mystery insect on roots of rice plant – note the ants that are “tending” them. This was the first time I’d come across these creatures. 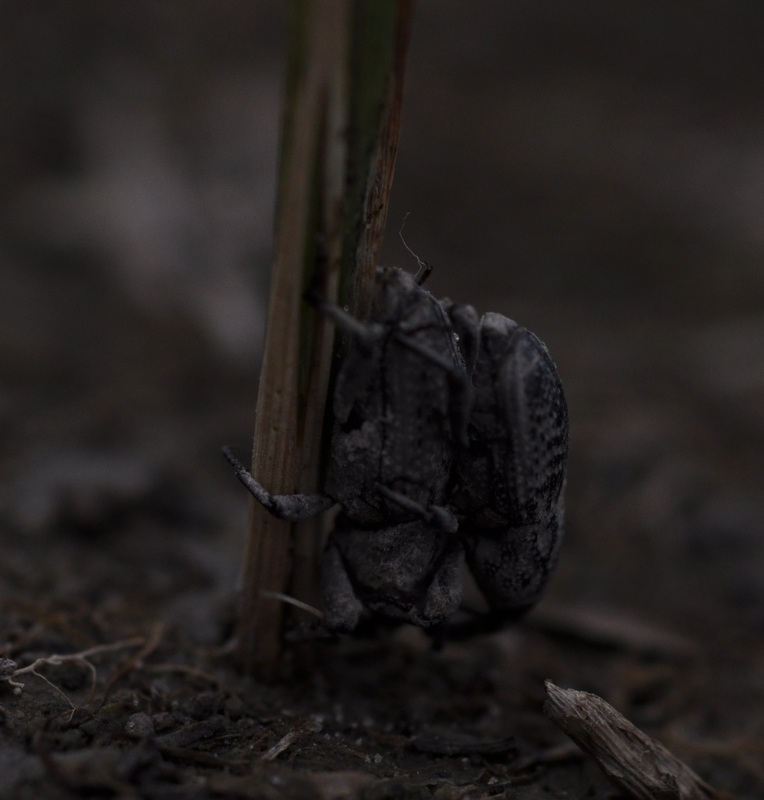 These mystery insects looked like some type of plant feeder – possibly a homopteran. It didn’t look like they were causing any injury, but it was a curiousity that I couldn’t miss photographing. Unfortunately, my pictures were a little blurry. I’m working on an identification today. 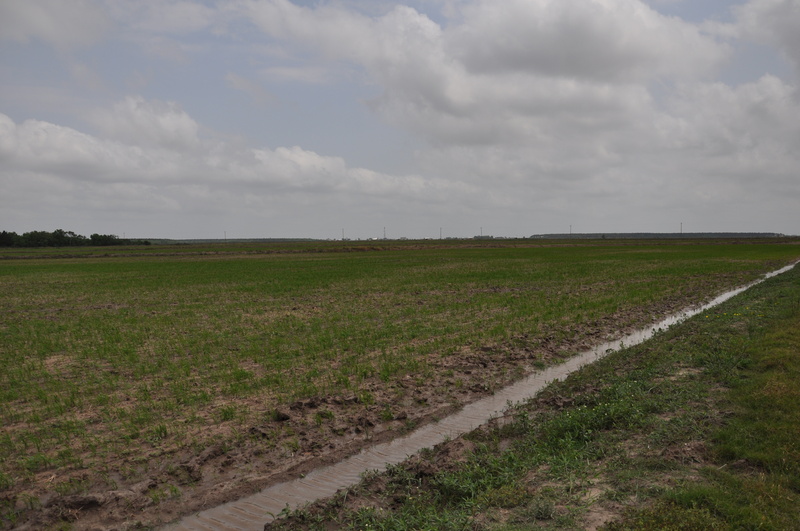 The last field we scouted was a field of hybrid rice that was water-seeded. 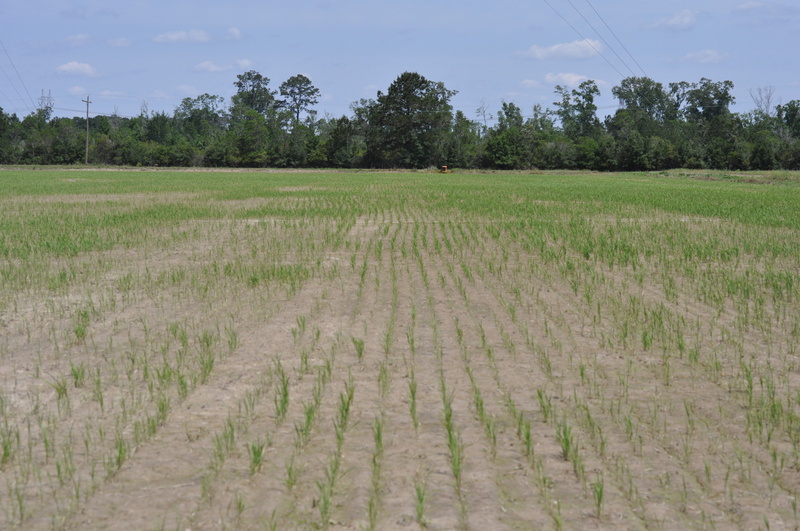 The stand was marginal and the rice was dying. 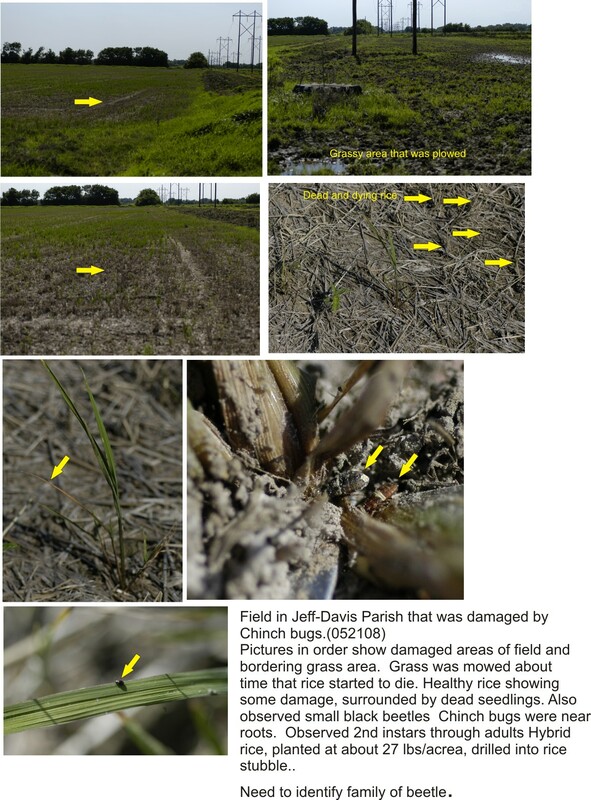 We suspect that a variety of factors may have contributed to the plant injury, one being excessive rice water weevil adult scarring. 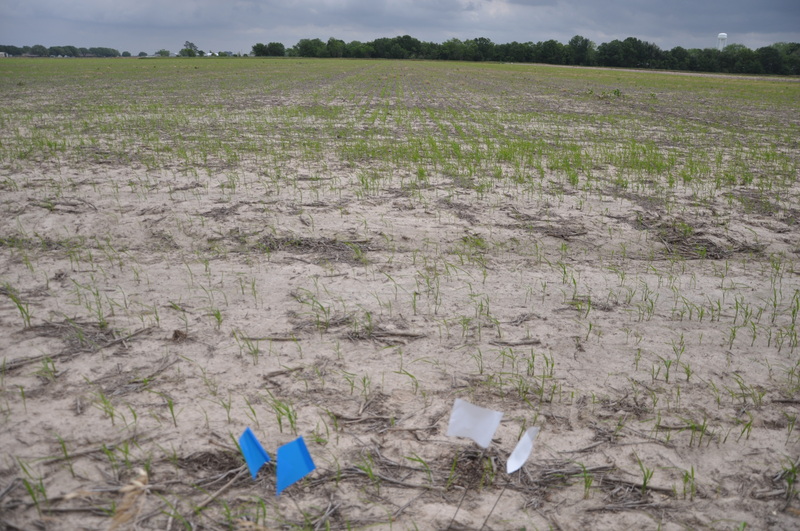 The field did not have any insecticide seed treatment (because it was water-seeded). 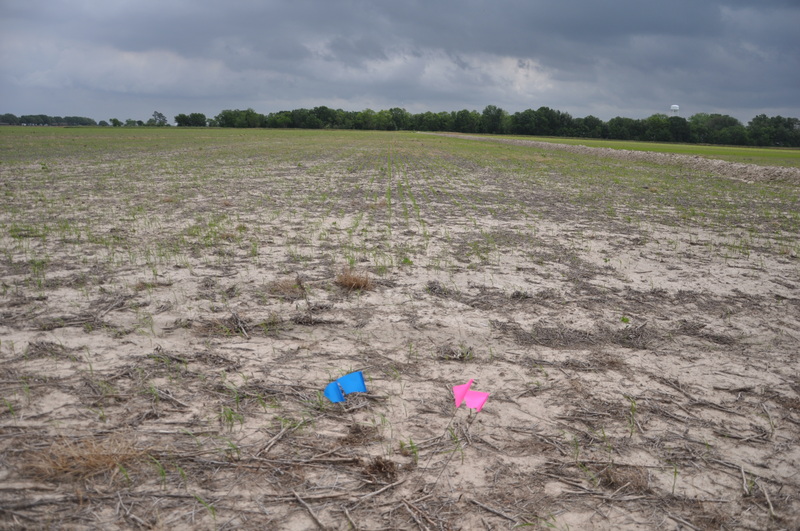 It is bordered by a crawfish field, so options are limited. We will see how it progresses.